This article discusses the major developments in the history of programming languages. In the first decades of the twentieth century, numerical calculations were based on decimal numbers. Eventually it was realized that logic could be represented with numbers, as well as with words. For example, Alonzo Church was able to express the lambda calculus in a formulaic way. The Turing machine was an abstraction of the operation of a tape-marking machine, for example, in use at the telephone conference calling companies. However, unlike the lambda calculus, Turing's code does not serve well as a basis for higher-level languages - its principal use is in rigorous analyses of algorithmic complexity. 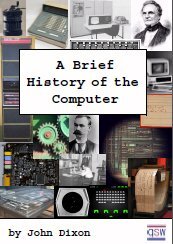 Like many "firsts" in history, the first modern programming language is hard to identify. From the start, the restrictions of the hardware defined the language. Punch cards allowed 80 columns, but some of the columns had to be used for a sorting number on each card. Fortran included some keywords which were the same as English words, such as "IF", "GOTO" (go to) and "CONTINUE". The use of a magnetic drum for memory meant that computer programs also had to be interleaved with the rotations of the drum. Thus the programs were more hardware dependent than today. To some people the answer depends on how much power and human-readability is required before the status of "programming language" is granted. Jacquard looms and Charles Babbage's Difference Engine both had simple, extremely limited languages for describing the actions that these machines should perform. One can even regard the punch holes on a player piano scroll as a limited domain-specific programming language, albeit not designed for human consumption. In the 1940s the first recognizably modern, electrically powered computers were created. The limited speed and memory capacity forced programmers to write hand tuned assembly language programs. It was soon discovered that programming in assembly language required a great deal of intellectual effort and was error-prone. In 1945, Konrad Zuse published details of his programming language Plankalkül. However, it was not implemented in his time and his original contributions were isolated from other developments because Germany was isolated during the war. COBOL, the COmmon Business Oriented Language, created by the Short Range Committee, heavily influenced by Grace Hopper. The use of Backus-Naur Form (BNF) for describing the language's syntax. Nearly all subsequent programming languages have used a variant of BNF to describe the context-free portion of their syntax. The introduction of lexical scoping for names in arbitrarily nested scopes. Algol 60 was particularly influential in the design of later languages, some of which soon became more popular. The Burroughs B5000 was designed to be programmed in an extended subset of Algol. Simula, invented in the late 1960s by Nygaard and Dahl as a superset of Algol 60, was the first language designed to support object-oriented programming. Smalltalk (mid 1970s) provided a complete ground-up design of an object-oriented language. C, an early systems programming language, was developed by Dennis Ritchie and Ken Thompson at Bell Labs between 1969 and 1973. Prolog, designed in 1972 by Colmerauer, Roussel, and Kowalski, was the first logic programming language. ML built a polymorphic type system (invented by Robin Milner in 1978) on top of Lisp, pioneering statically typed functional programming languages. The 1960s and 1970s also saw considerable debate over the merits of "structured programming", which essentially meant programming without the use of GOTO. This debate was closely related to language design: some languages did not include GOTO, which forced structured programming on the programmer. Although the debate raged hotly at the time, nearly all programmers now agree that, even in languages that provide GOTO, it is bad style to use it except in rare circumstances. As a result, later generations of language designers have found the structured programming debate tedious and even bewildering. However, one important new trend in language design was an increased focus on programming for large-scale systems through the use of modules, or large-scale organizational units of code. Modula, Ada, and ML all developed notable module systems in the 1980s. Module systems were often wedded to generic programming constructs---generics being, in essence, parameterized modules (see also parametric polymorphism). Although major new paradigms for programming languages did not appear, many researchers expanded on the ideas of prior languages and adapted them to new contexts. For example, the languages of the Argus and Emerald systems adapted object-oriented programming to distributed systems. The 1980s also brought advances in programming language implementation. The RISC movement in computer architecture postulated that hardware should be designed for compilers rather than for human assembly programmers. Aided by processor speed improvements that enabled increasingly aggressive compilation techniques, the RISC movement sparked greater interest in compilation technology for high-level languages. Language technology continued along these lines well into the 1990s. However, the adoption of languages has always been driven by the adoption of new computer systems, and in the mid-1990s one of the most important new systems in computer history suddenly exploded in popularity. The rapid growth of the Internet in the mid-1990s was the next major historic event in programming languages. By opening up a radically new platform for computer systems, the Internet created an opportunity for new languages to be adopted. In particular, the Java programming language rose to popularity because of its early integration with the Netscape Navigator web browser, and various scripting languages achieved widespread use in developing customized applications for web servers. Many computer information systems degree courses today teach Java as well as other programming languages. Neither of these developments represented much fundamental novelty in language design; for example, the design of Java was a more conservative version of ideas explored many years earlier in the Smalltalk community, but the widespread adoption of languages that supported features like garbage collection and strong static typing was a major change in programming practice. Mechanisms for adding security and reliability verification to the language: extended static checking, information flow control, static thread safety. Alternative mechanisms for modularity: mixins, delegates, aspects. Increased emphasis on distribution and mobility. Integration with databases, including XML and relational databases. Open Source as a developmental philosophy for languages, including recent languages such as Python, Ruby, and Squeak. Support for Unicode so that source code (program text) is not restricted to those characters contained in the ASCII character set; allowing, for example, use of non-Latin-based scripts or extended punctuation.